Having MDS will have impact on your daily life. Each person will cope in their own unique way. Not everything in this gallery will apply to you, but there might be feelings that you are familiar with. It is hard to directly "change an emotion", while thoughts and behaviours are more easily changed. 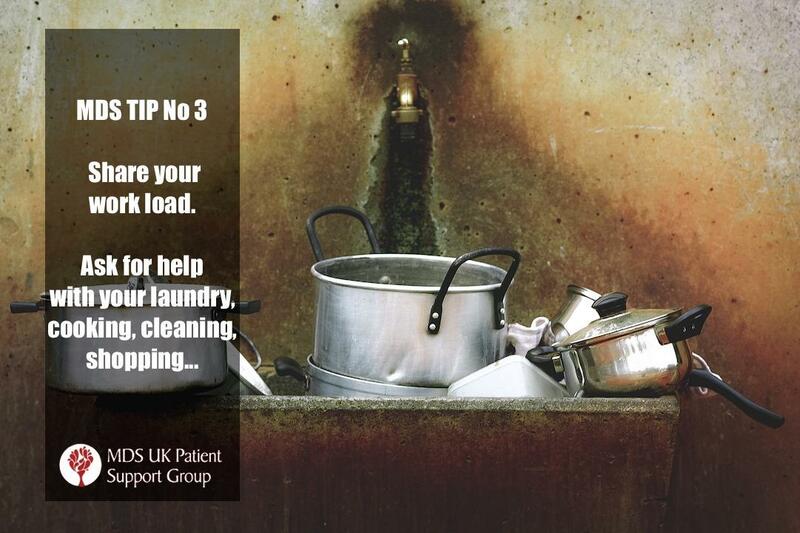 We hope you try some of these tips, those that suit you best. They can help you to gain back control. The way we think affects the way we feel. MDS-TIP-1: Share your feelingsShare your feelings with your loved ones. It can help you manage your stress and anxiety. 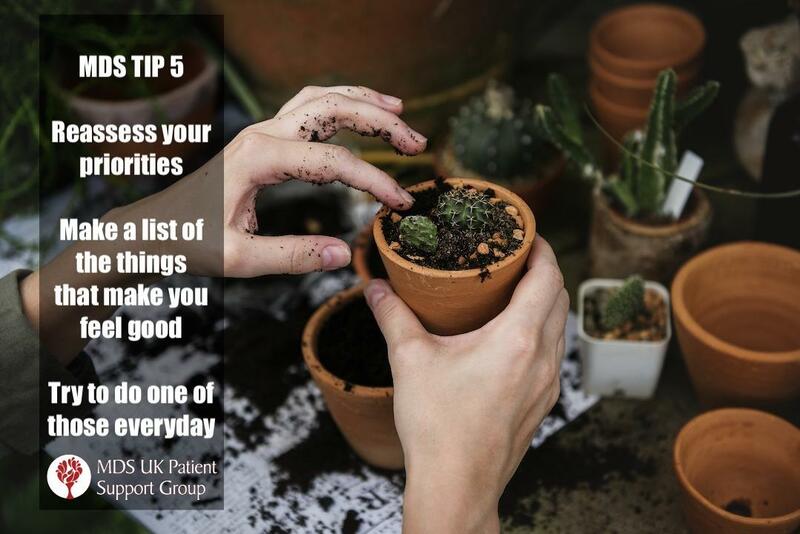 MDS-Tip-5: Reassess your prioritiesMake a list of the things that make you feel good. Try to do one of those everyday. 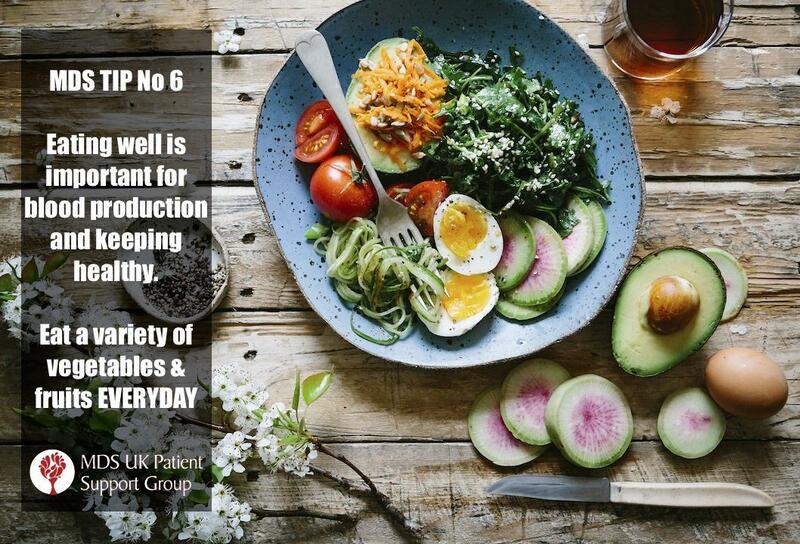 MDS-TIP-6: Eat vegetables and fruits everydayEating well is important for blood production and keeping healthy. Eat a variety of vegetables and fruits everyday. 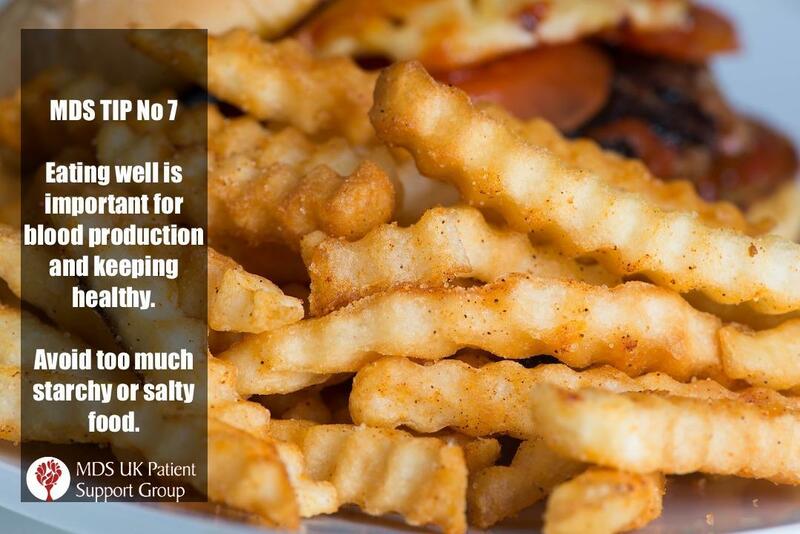 MDS-TIP-7: Avoid too much starchy or salty foodReplace starchy or salty food for unprocessed grains such as brown rice, barley, oatmeal or quinoa. 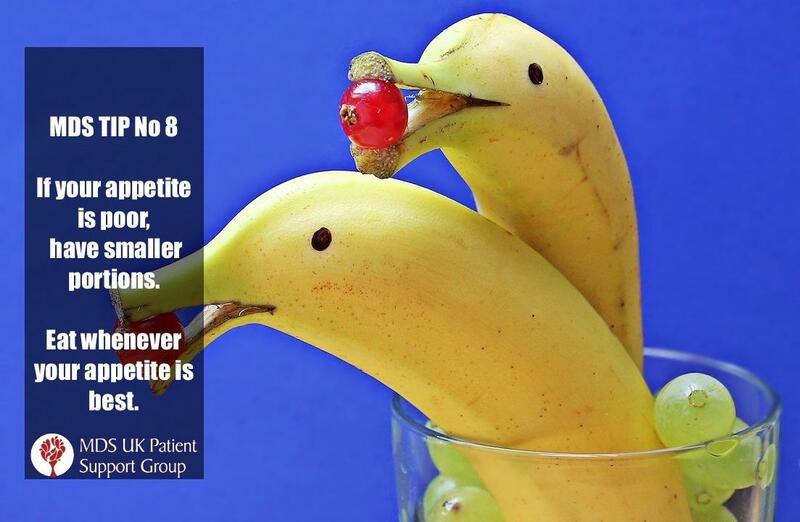 MDS-TIP-8: If your appetite is poor have smaller portionsIf your appetite is poor, have smaller portions. eat whenever your appetite is best. 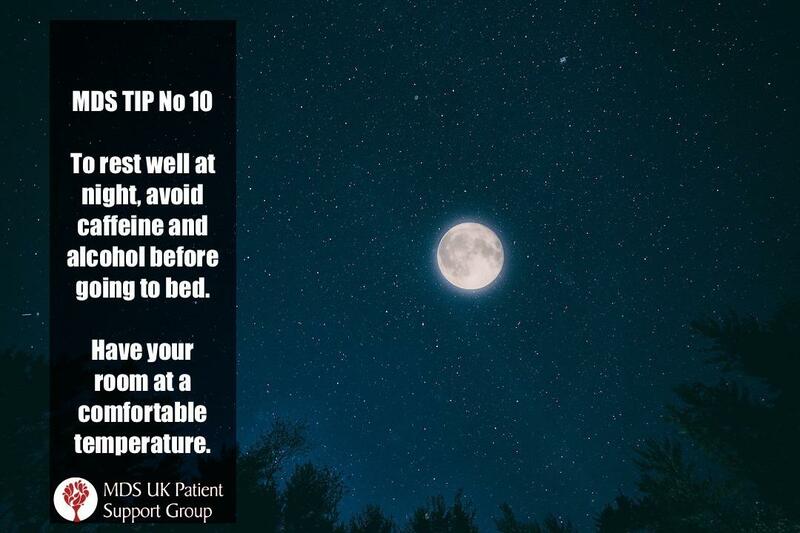 MDS-TIP-9: How to rest well at nightTo have a good rest at night, have a regular sleep/wake pattern. 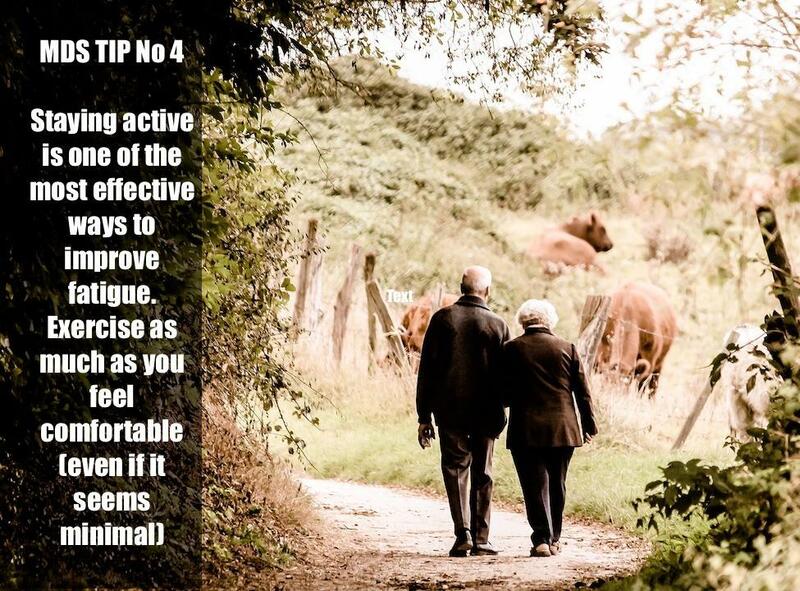 Keep as active as possible. 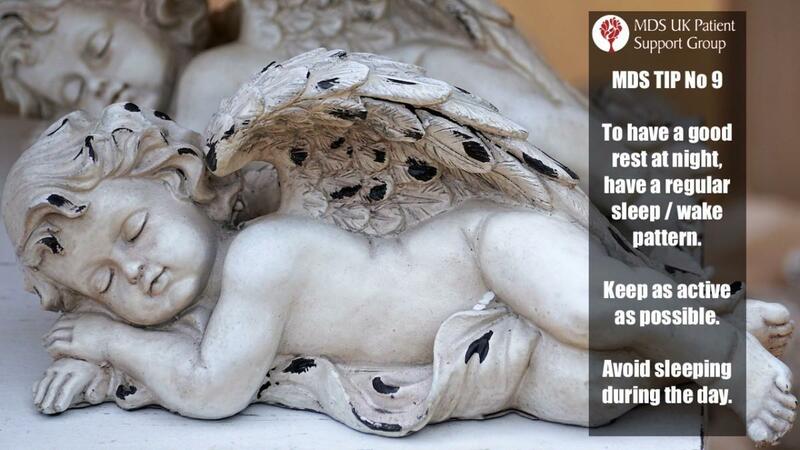 Avoid sleeping during the day. 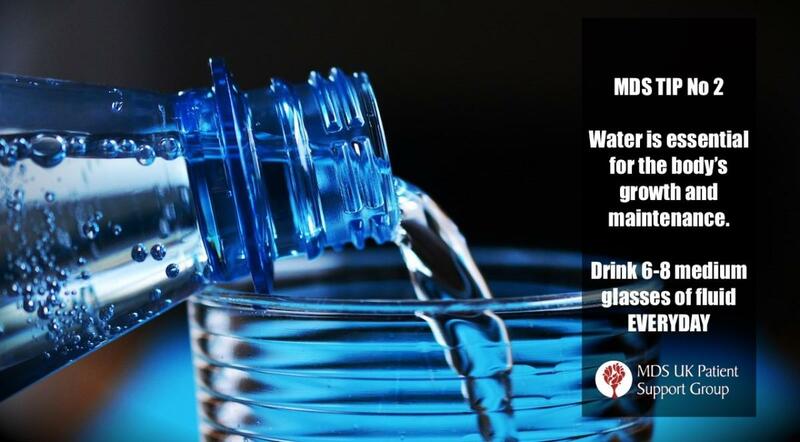 MDS-TIP-10: Rest wellTo rest well at night, avoid caffeine and alcohol before going to bed. Have your room at a comfortable temperature. 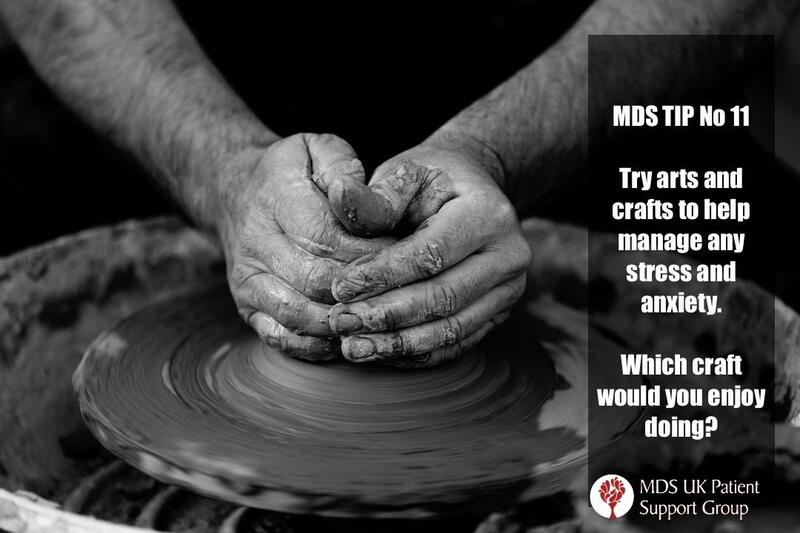 MDS-TIP-11: How to manage stress and anxietyTry arts and crafts to help manage any stress and anxiety. Which craft would you enjoy doing? Go for it and try it! 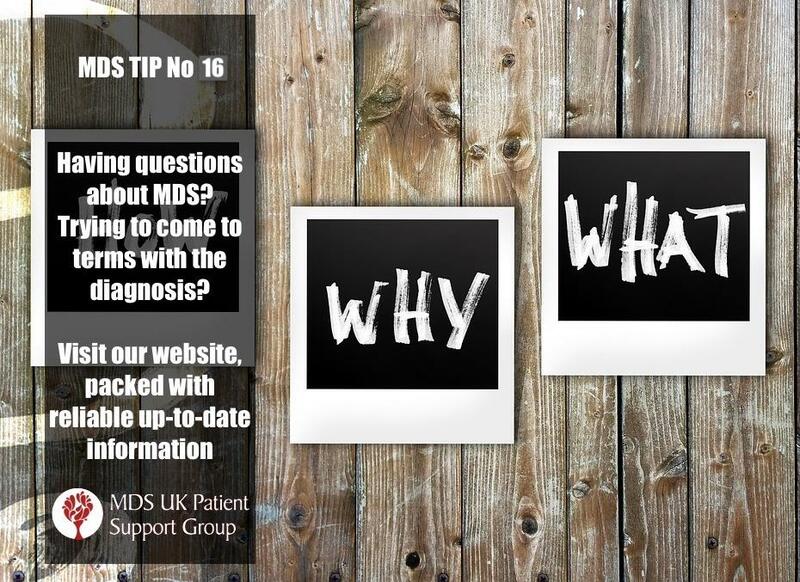 MDS-Tip-12: Having questions regarding MDS?Having questions regarding MDS? Trying to come to terms with the diagnosis? 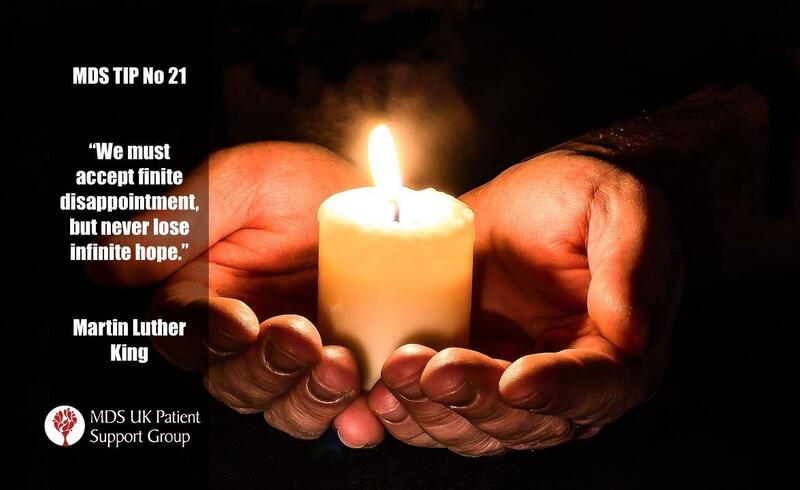 Don't be shy to ask nurses, consultants, and the support group, even if they seem silly questions. 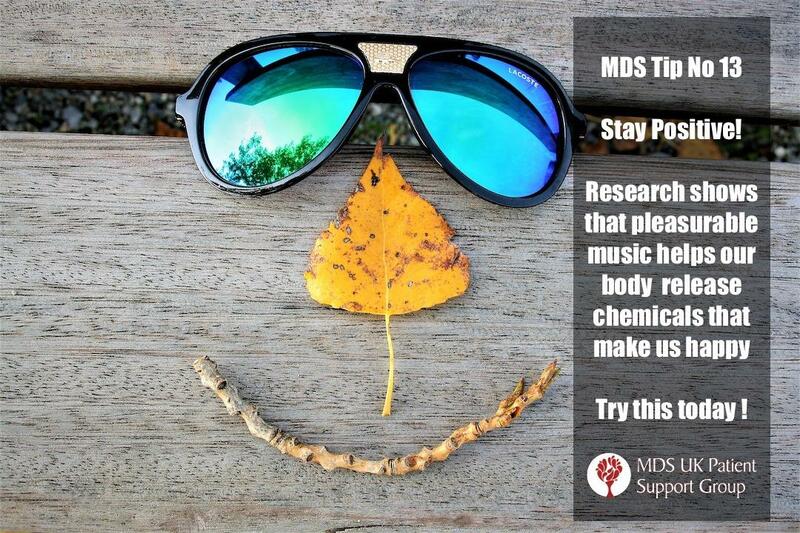 MDS-Tip-13: Stay Positive!Easier said than done... Research shows that pleasurable music helps our body release chemicals that make us happy. Try this today! 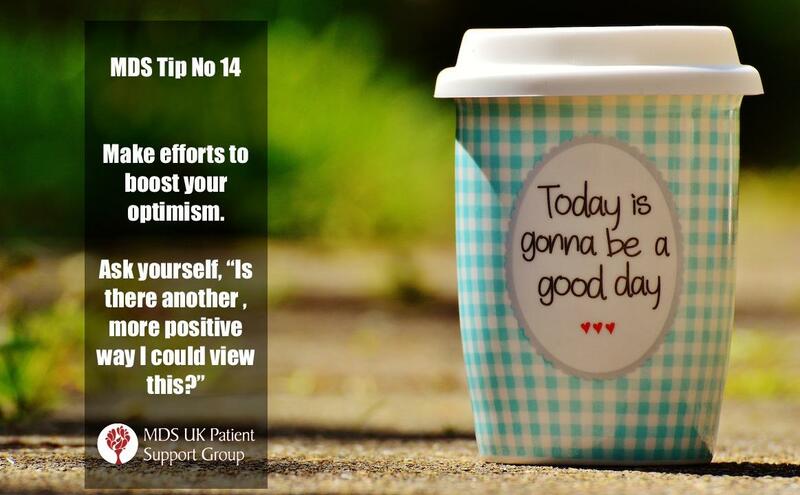 MDS-Tip-14: Boost your optimismMake efforts to boost your optimism. Ask yourself: "Is there another, more positive way I could view things? 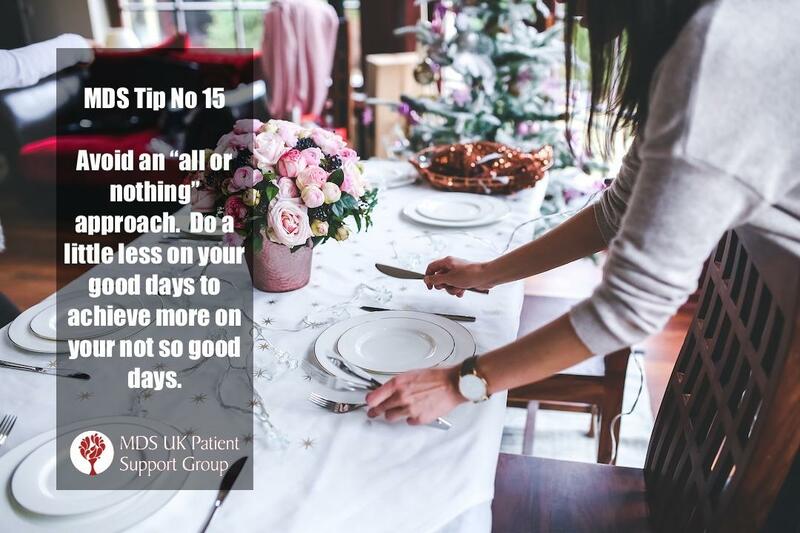 MDS-Tip-15: Avoid an "all or nothing" approachAvoid an "all or nothing" approach. Do a little less on your good days to achieve more on your not so good days. 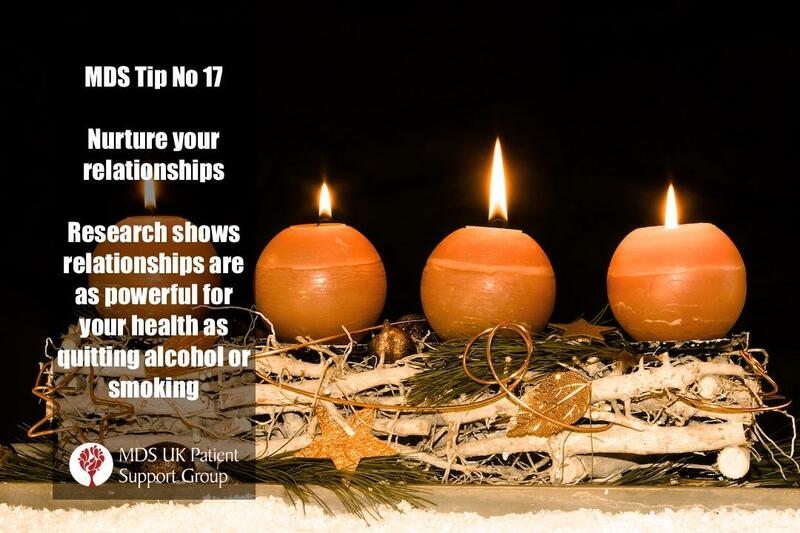 MDS-Tip-17: Nurture your relationshipsNurture your relationships. Research shows that relationships are as powerful for your health as quitting alcohol or smoking. 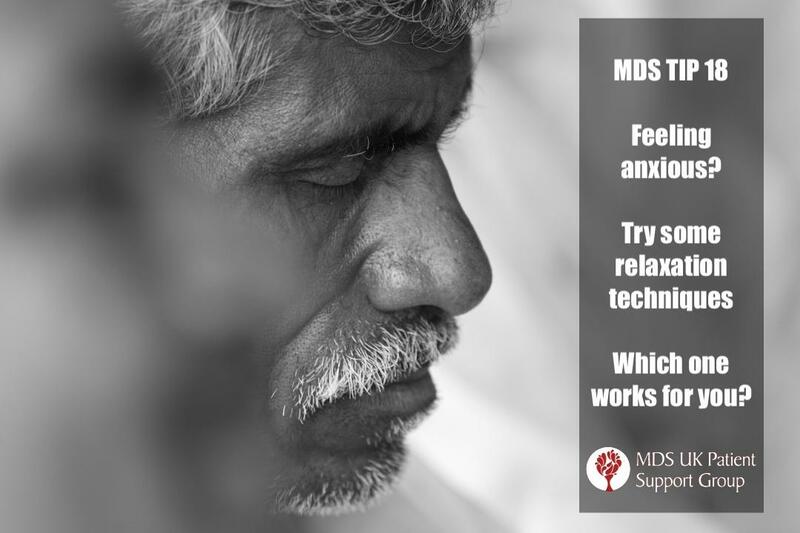 MDS-Tip-18: Try some relaxation techniquesIt is normal to feel anxious about the future when you have MDS. When you recognize you’re tense, take a deep breath. Research shows that breathing slowly and deeply for 3 minutes a day can help reduce stress. MDS-Tip-19: Help us FundraiseContributing to the community can make you feel empowered. 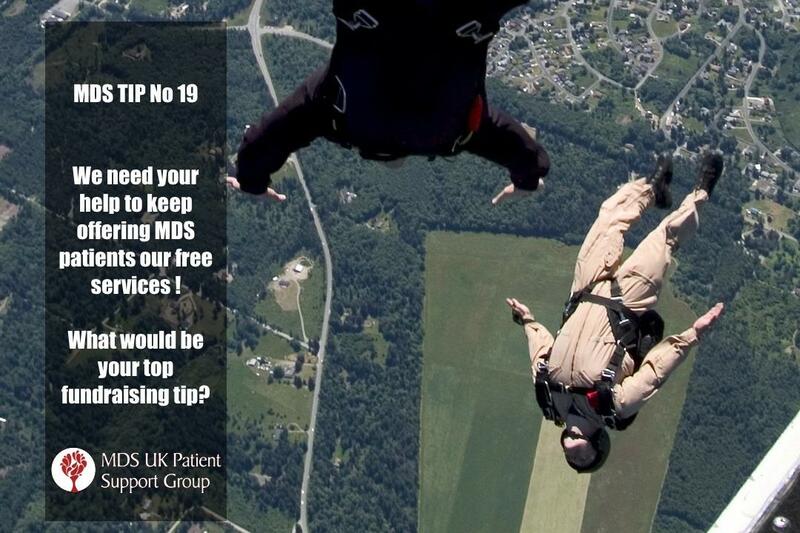 And we need your help to keep offering MDS patients our free services. 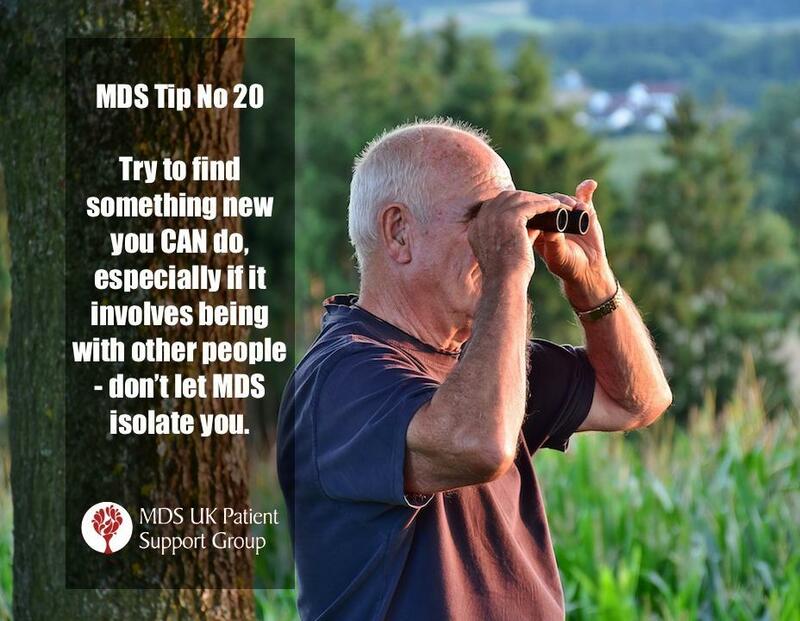 MDS-Tip-20: Try to find something you CAN do.Try to find something you CAN do, especially if it involves being with other people. 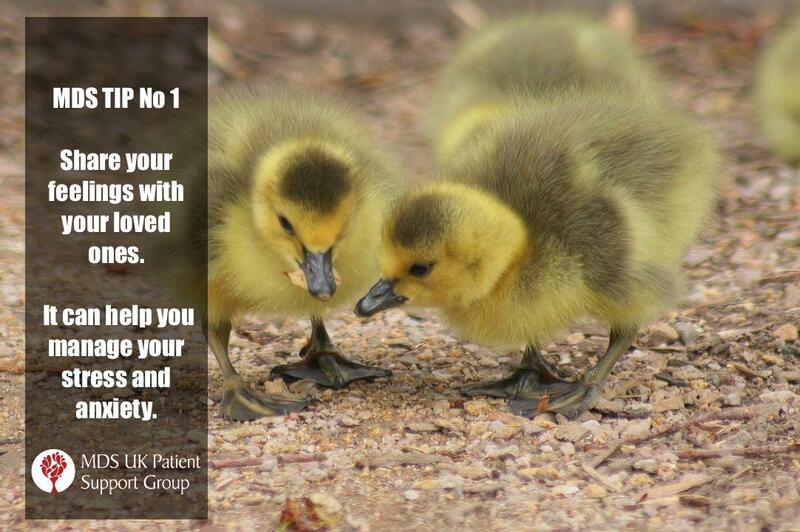 Don't let MDS isolate you. 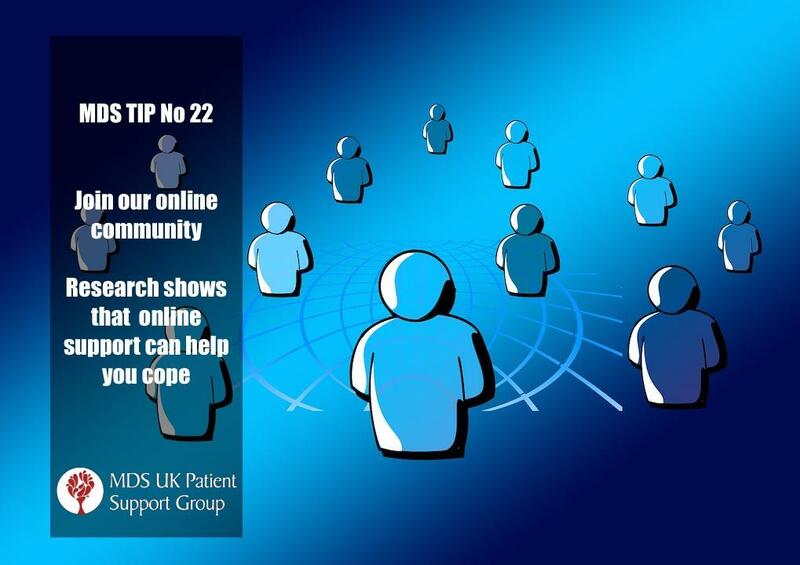 MDS-Tip-22: Join our online communityJoin our online community. Research shows that online support can help you cope. 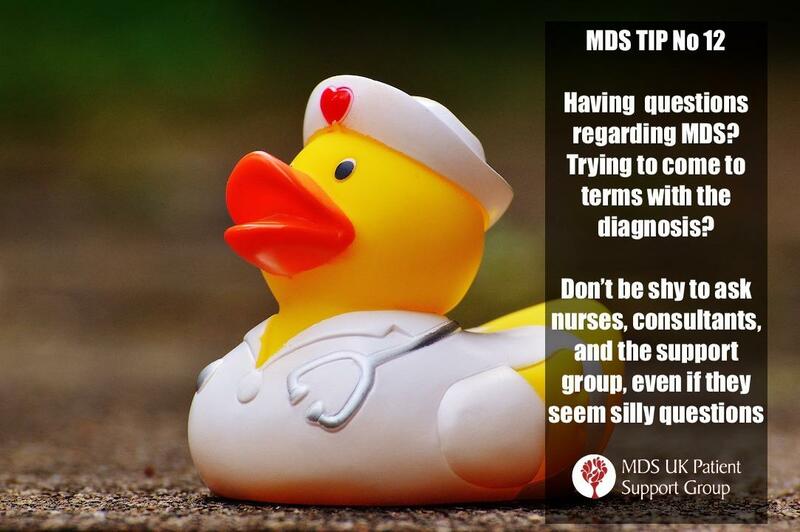 MDS-Tip-23: Request a second opinionHaving questions about MDS? Trying to come to terms with your diagnosis? There is no definite course for your disease. 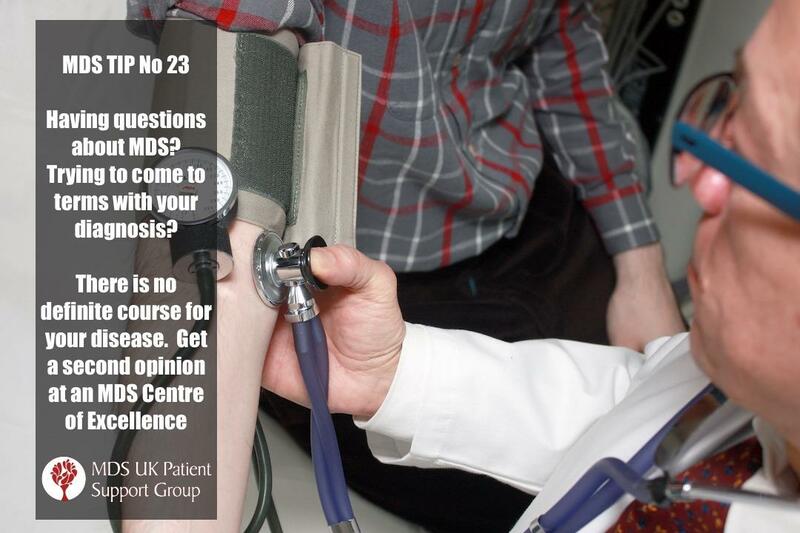 Get a second opinion at an MDS Centre of Excellence.